In this article John Stanley talks about collecting antique beer and soda bottle openers, including figurals and other varieties. Based in Durham, North Carolina, John can be reached through his website, Just For Openers, which is a member of our Hall of Fame. My mother brought home a bunch of openers back in 1977, and that got me started collecting. I thought it would be pretty neat to do because nobody else was collecting them. 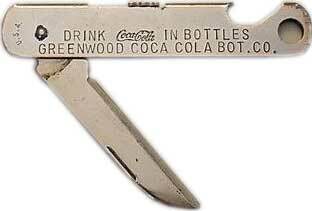 Then I heard about a national club in 1982, and found out there were hundreds of others collecting bottle openers. The club is called Just For Openers, and we have about 250 members. So much for being the only one! Bottle openers were introduced around 1894, when they put the first bottle caps on bottles. They needed a cap lifter for them, and William Painter, from Baltimore, Maryland, invented it. Actually he was trying to invent the bottle cap, the crown cap. But because he needed it, he came up with a little cast-iron opener to pop that cap. And they caught on… both the crown caps and the openers. It spread all over the country. Since then, thousands of styles of openers have been made. Our handbook pictures about 1,200 different beer bottle openers. When you get into general openers, there are 2,000 or 3,000. I collect beer, soda, a little bit of everything. The more unusual an opener is, the more I like it. One of my favorite styles is what we call the flat figural. There’s one shaped like a baseball player, one shaped like a car, one shaped like an eagle. A lot of these were made from 1910 to 1920 before Prohibition, just as a promotional mechanism for the breweries and soda companies that made them up. There’s one shaped like a dog that was put out in the ‘30s. A lot of them had the brewery name and the brand name. Some just had the brand, but they almost always had some kind of add-in business name. The little car-shaped opener, you’ll see a lot of garages and car dealerships back then who used it. Most of them are small, 3 to 4 inches, something you could carry in your pocket. They almost always had a key ring hole in them so you could put it on your key chain. Any kind of company back then used them. It wasn’t just beer. It was Coca-Cola, all the major soft drink companies. Anybody could have a few hundred to a few thousand made up, depending on how much money they wanted to spend. They were fairly cheap. Most of the beer openers were made in the northern Midwest or on the West Coast. There are a few southern breweries, but you don’t see a lot of those. Wisconsin and Pennsylvania, they had by far the most breweries. There are a lot of different beer openers from those states. As you might expect, Anheuser-Busch is popular with collectors, especially the newer stuff, they put out the most openers. But most guys collect from their part of the country. Our convention this year was in St. Louis and there were probably five or six guys there that either collect just St. Louis or just Missouri. Collectors Weekly: Who manufactured the openers? Stanley: There were probably 15 or 20 companies we know of. One that many collectors like is Vaughan, out of Chicago. They actually made openers up until 1984, and they made a lot of different styles. There was also the Williamson Company in Newark, New Jersey, which did corkscrews and openers. And two or three companies in New York City. Making a metal opener with an engraving of a figure on it is something that would be hard to do today, because of the know-how required, but it was no problem back then. Circa 1900-1919 B-21 Mobile Auto Co.
About 20 years ago, I tried to look into having a baseball player made. And one die company up in Ohio thought they could do it, but to make the die was going to be about $2,500 or $3,000. You can get them made in Asia if you have contacts over there. They make them in brass, and it’s not that hard to do. They can make them pretty cheap because of the labor cost. We’ve been able to identify most of the early manufacturers because most of them would stamp the opener somewhere, especially pre-1920, with their company name. But between the two world wars, a lot of them didn’t make it. Prohibition caused a lot of problems besides the breweries being forced out of business. Companies like those that made the openers lost a lot of customers. 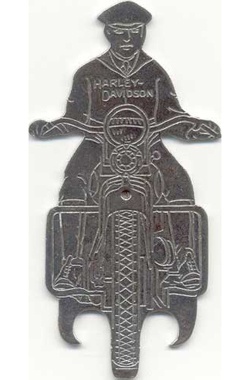 The heyday of collectible bottle openers, as far as the figurals and the really neat designs, would have been 1910 to 1920. Prohibition kicked in in 1919. There was a revival in ‘33, you see quite a few good ones from that era, but starting about 1950, it got down to the basic can-pierce type opener that a lot of people still have around today. There are a lot of really neat and hard to find figural openers. Take a look at my website, the one at the top that’s from the Narragansett Brewing Company. It’s an Indian, and it’s one just about everybody wants because it’s such a neat piece. And the other one I show there, actually from the ‘20s or ‘30s, is the Harley Davidson. There’s a little guy on the motorcycle. Quite a few openers also had knives or other implements like corkscrews or even nail clippers. We call them multi-tools. There are some that are cutters and then also have a little buttonhook for lacing up shoes. In the 1910s and ‘20s, guys got into seeing how many tools they could get onto one piece that you could carry in your pocket. And they wanted try to patent something different too. Many openers also had a square hole to turn on the old gas carbide switch on headlights, and you could use it on the gas tank as well. When Adolphus Busch (the original guy) was getting older around the turn of the century, he had quite a few made up in Germany, and handed them out to friends or whoever. There’s quite a few variations of the knives he gave out. A lot of them are really ornate, real pretty, and they’d have a couple of knife blades or a corkscrew. And a lot of times he had what they call a stanhope located in the handle. There was a little lens magnifier, and you could hold it up to the light and look in and he’d have his picture in there. Certain guys, that’s pretty much all they collect, those Anheuser-Busch ones. Occasionally someone will still make still make a figural opener today, Anheuser-Busch or somebody, once in a blue moon. There’s a guy in our club from Connecticut who made one for Anchor Steam in San Francisco. It was a little bottle-shaped opener that goes on the key ring, made out of titanium. Pretty neat, and very durable. Collectors Weekly: What was the inspiration behind your website? Stanley: I still work full-time so I don’t get to spend a lot of time working on it. Its just to give people a basic feel for the opener collecting in general. It’s laid out by state because a lot of people collect that way, or they collect the brewery from a certain state. We also have our little handbook on the site, there’s a lot in there. It’s a big PDF of a color book we did about 10 years ago. The guy who started our club, Don Bull, and myself, did it. It’s got nice color pictures, that give you an idea of what the openers look like. I mostly collect American openers, but I’ve got quite a few Canadian and some Australian and a few from Europe. The European had just a few basic styles, they don’t have many figurals. For example, I’ve got a medallion opener, like a big silver dollar with an opener above it. On the medallion, they advertise different towns or people. It’s just a basic style. There were a lot of different English breweries and Australian breweries, and they had basic cast iron openers, not a lot of variety. Collectors Weekly: Where do you find new openers for your collection? Stanley: eBay has certainly become the main source. Plus we do a lot of trading between club members, and I used to find them at flea markets and antique shows. There’s three or four national beer clubs and they have annual conventions and shows almost every weekend, so you can find them at those shows. I collect certain styles, plus the figurals, so I have a long list. There are almost 16,000 known collectible beer openers, and I have about 3,000 openers in my collection, so I’m not trying to go after all of them. But we have two or three guys in our club that have them. if you’ll look on the website, you’ll see a little video about Art Santen in St. Louis, who has about 40,000 in his collection. He buys about anything he sees, although he’s slowing down now in his older years. I display my collection in a little glass top showcase with cardboard sides. That way I can carry them to shows pretty easily. And I’ve got some frames up on the wall too. I started collecting in 1977. I had an opportunity in the 1990s to get a lot of the ones I wanted. I’ve got so many different areas I like, it gets pretty overwhelming. The reason you find out about most people starting to collect openers – I hate to say this – but its because they’re pretty cheap as a rule. You can get them for a buck or two, 50 cents or whatever. You can get a bunch that way. But at some point, you get so many and you got to start paying more, hundreds of dollars. And when you get into the corkscrews, it can get pretty pricey. I have quite a few but mainly the ones with beer advertising. Collectors Weekly: What resources can you recommend to potential bottle opener collectors? Stanley: The guy that I wrote the book with, Don Bull, started Just For Openers in 1979. But I didn’t sign up until 1982. We have an annual convention in April each year. This past year we had 39 members come, and a lot of them bring their spouses. Mainly we do room-to-room trading, and then in St. Louis there were three local collectors who had open-house tours and we went and saw their collections. Saturday of the show week, we get a big ballroom where everybody sets up and arranges their stuff. And we’re open to the public so they could come in to look and see. But there’s a lot of room-to-room dealing. The problem is that there’re so many openers; you like this, you like that. The sooner you can figure out what you really like and concentrate on it, the better off you are, but it is tough to decide. It took me a few years. eBay is by far the best source for openers, but you won’t ever see any more openers than you will at our convention every year. There are also the two books we’ve done. One’s called Just For Openers, which has all our beer openers plus some soda. The second one’s called Just For Soda Openers. Most collectors start with either one or the other. In fact, these handbooks, which we did in ’98, are how most guys tend to find out about the hobby. Most soda openers are similar to beer openers but there’s a few distinct soda styles. Coca-Cola made by far the most different styles, and there are certainly a few Coke openers with no company name on them. There’s a couple of Dr. Pepper openers. And Pepsi. Another good resource is the club’s quarterly newsletter that comes out every three months. For probably the first 10 years, in a lot of the early issues, Don was able to find and publish the patent information. I do usually go to the Google and try and search the patent information to see if a piece was patented. That way you can find out who came up with the idea. Don was pretty successful with that, with the older openers. Google’s got a patent search and then you can just Google it, too, so either way. You don’t get a hit too often on the historical part, but every now and then, something hits. There’s also a guy, Alan Petretti, who does a big Coca-Cola book, annually, and he’s got four or five pages just for Coke openers in there. You can find a little information that way. And the handbook that’s on my website, that Don started that in 1979, we just agreed to put it up and let people download it and print it. There’s quite a bit of information there. seen these and other similar figures such as cowboy on sign but none with ashtray. The drunk on a lamp post cast iron comes with and without an ashtray. It is fairly common either way. These were made from the mid-1940s to the mid-1960s. Value is $5-$25 depending on condition but so many have been sold on eBay the value is not much. Not sure about the stamping on the bottom. Starr “X” , Brown Co.
Is it actually old or worth anything? Jason, your Coca-Cola wall mount is common and can bring $2-$10 depending on condition. They have been made from the 1940s until today with many variations. Yours is an older one. I found an Eagle Top Off bottle opener in a Free box at a garage sale. Has the Pat. Pending on it and also the raised eagle. It’s in good shape. What would be the value of this??? If it the “Chase Patent” Eagle, $40-$50. Without a picture any other design would most likely be under $10 in value. While in Cuba 1956 aboard the USS Saratoga CVA-60 shakedown cruise I picked up Starr “X” opener Lo Mejor Hatuey. It was our favorite beer at that time. It has a number 46 on the back with Made in U.S.A. Is it worth anything in todays market? Please advise. Thank You. How can you tell original Starr “X” openers from new reproduction openers? Confused. Please advise. Thank You. 57) The Lo Mejor Hatuey has minmal value being foreign , $5-$10. I am sure it has more sentimental value to you. The number 46 is a mold number. Usually 12 openers were made in each mold and each one was numbered. I have a vaughen six way opener. Any idea what the six ways are? we have found five. What are the five ways you have figured out? A simple question. Stamp collectors are known as “philatelists”, is there a name for the collectors of bottle openers? Thank you. Sorry, we are just bottle opener collectors. No fancy name. I have an old bottle opener that looks like the one in this eBay listing :160694054415 – except that mine reads”DRINK A BITE TO EAT” at the top and “AT 10,2&4 O’CLOCK” on the bottom. The other side is the same on the bottom but reads “DRINK Dr. Pepper” and in small print “VAUGHAN CHICAGO” at the top. It was with my grandfather’s stencil kit that he used to paint mailboxes during the Depression. It has been a keepsake for a long while. I would be surprised if it was worth more than $10 but I am really interested in the Dr. Pepper tie-in. I have found references to the ad slogan being used between 1920 and 1940. That is a long time – how might I be able to narrow down the date of my opener? I have an old beer bottle opener made of wood, which has a handle that’s been carved into a bust of a man wearing a tall top hat & very detailed nose & wide smile w/tiny teeth. He’s dressed in an open-collared shirt & a belt w/an average sized rectagle buckle. I can’t find any ID marks or writings so I can’t identify it – I don’t have an application on my old computer to enable me send a photo to you. Does any of this sound familiar to you? Should old bottle openers be cleaned and if yes with what? I have a metal bottle cap and opener: Sav Kap Boston – Pat Dec 7, 1926. I cannot find it on the internet. Can you give me any info and value to this? I have a flat brass bottle opener stamped with “Gilt Top” BEER S.B.&M.CO. SPOKANE, WASH. It has a square hole in the opener end, and a round hole in the opposite end. Could you tell me any information about this opener? Thank you. Your brass opener is from the Spokane Brewing & Malting Co. and was made in the 1910-1920 time frame. Square hole was used to turn on old gas headlights for cars. There are about 50 different known U. S. beer advertising openers in this same style. Your opener is not rare but also not common. With full black paint worth $50-75. I have an E-8 style Grand Rapids Brewery, Grand Rapids Wisconsin.. Never reopened after prohibition. I learned that Wisconsin Rapids was formerly known as Grand Rapids, but had to change its name as the Post Office kept mixing it up with Grand Rapids MI. Do you have any ballpark on value? You have a very rare opener. Not many pre-1920 openers from Alabama. Thank you for posting information on it. “ ” When we weren't in a show, part of our job was to make balls of frozen dog food.